And thanks for giving the husband and me something to chuckle at this a.m. I told him from now on in the morning when you hear me laugh and say, "What?" and I say, "Linda" - you know who I'm talking about. Congratulations!! Quite an accomplishment! 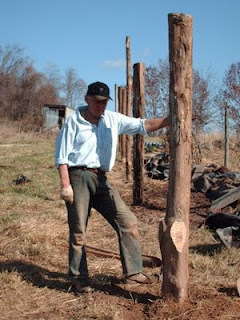 And I'm wondering how long you had to scour the internet for that picture of the guy with the posts! LOVE IT! *cheers* Congrats on the 100th post! Yay!! Well done, bb! I'm happy to keep reading them. Yaaaaaaaay!! Confetti, cake, & Congrats are in order. Of course may there be many more! hooray! you're 100! erm, i mean your blog is 100 posts old. CONGRATS!!! Congrats! That's pretty terrific. I love learning new cheers. So glad you kept at it! I always enjoy your funny posts. And comments. I'd miss you if you disappeared! Yay! Congrats! I like the cheerleader with her bra off!! !That sounded weird. Jessica -- You're so welcome, both of you. Glad if I can give you a chuckle. I enjoy your blog so much! It's doesn't matter what it's about, you manage to make it funny, and it always lifts my mood. :) Congrats! You are determined to turn me into a vlogger, aren't you? P.S. Did you see today's entry on http://catalogliving.net? Totally reminded me of your last few posts. Elizabeth -- YES! Vlog, baby, vlog! Oh, and that website is a hoot. Love the "eating rocks" comment. Tee-hee. YAY!!!! The cheerleader with her bra off is the proper level of excitement here! Keep going because you are such a joy to read, Linda. 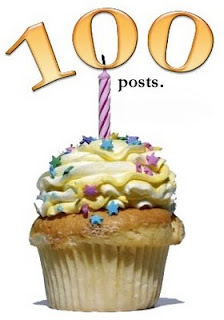 Yay for 100 posts! I'm glad I found your blog. OK, I'm seriously cracking up over the cheerleader with her bra off! I'll have to send that to my mom.